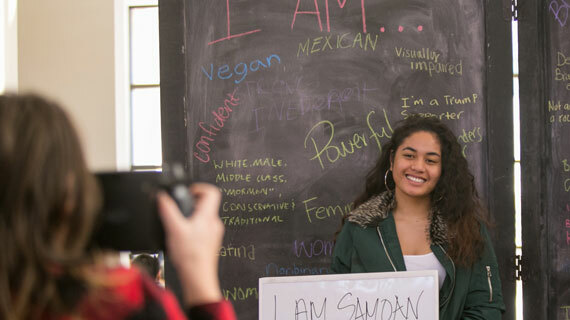 This week at Southern Utah University students celebrated Identity Week, a week-long series of events bringing awareness to the different cultures on campus. The week featured events such as a Cultural Celebration, a diversity centered Campus Connect, Friends and Faith, Spectrum of Gender and Sexual Identity Seminars, the Asia Project, ending the week with an event called “We’re all T-Birds.” Each event featured different clubs and organizations on campus. The first event, a Cultural Celebration, showcased several outstanding performances by different clubs on campus. A few of the clubs that participated were the Black Student Union, the Polynesian Club, and the Native American Student Association. Each club also had a booth where students could get to know more about their culture. The second event was a Diversity Campus Connect. Campus Connects are events partnered with different clubs on campus where students can learn more about the clubs and even join them if they want. The Diversity Campus Connect focused on all the diverse clubs SUU has to offer. Some clubs in attendance were the Black Student Union, Thunder Crew, the Poetry Club, LDSSA, and Improv Club. The third event was the Friends and Faith event. It was at this event students were able to discuss various topics with the different student religious organizations on campus. This event featured some open dialogue and games. The fourth event, Sexual Orientation and Gender Identity Seminars, included several seminars at various times. There was a gender identity seminar followed by a sexual orientation seminar, then to wrap it up, an “How to be an Ally” seminar was held. These events opened discussion to students and gave insight concerning these topics. The fifth event of the week was the Asia Project. This event featured spoken word poetry by the people behind the Asia Project. The Asia Project is a traveling group who combines music and spoken word poetry to create a beautiful story. The poetry read was both comedic and moving. The last event of the week was an event titled “We’re All T-Birds.” This event focused on unifying students and breaking stereotypes. At the event students could socialize, snap a fun Polaroid picture, and focus on uniting as T-birds. “Friday’s event, ‘We’re All T-Birds,” was really important because it focused on breaking stereotypes and celebrating the fact that we all have this unique experience to be T-birds together,” said Wood.